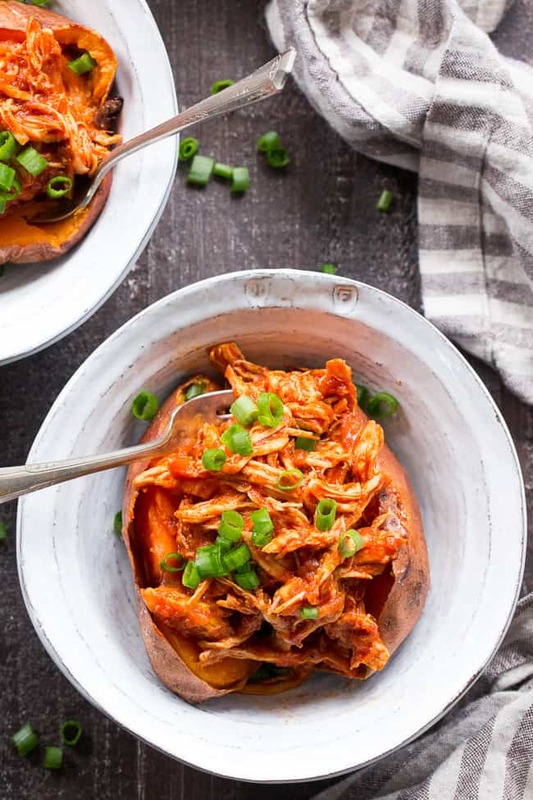 This simple Paleo and Whole30 Instant Pot BBQ Chicken is packed with flavor and perfect over a sweet potato or your favorite greens! 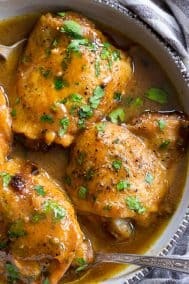 An easy homemade BBQ sauce is cooked right in with the chicken for a meal that’s ready in 20 minutes – perfect for weeknights and family approved! It’s downright ridiculous how long I’ve had my Instant Pot without actually using it to create a recipe! In my defense, the Instant Pot can feel a little intimidating in the beginning if you’ve never used a pressure cooker, and, well, I typically procrastinate when I’m intimidated, to be honest. Okay fine, if I’m going to be REALLY honest, I’ll tell you that I had a couple of Instant Pot failures months ago that threw me off balance and made me want to put the dang pot in the garage with all my other unused kitchen gadgets. But, I decided to keep it in the kitchen. 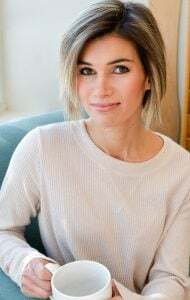 I only used it to make bone broth for several months (I used this recipe) while NOT doing my research to figure out how to properly use it for all the sorts of things people use an Instant Pot for. And so, the intimidation factor faded and laziness settled in. 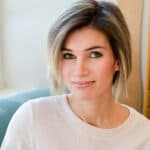 But let’s face it – it’s hard to avoid the Instant Pot – it’s literally everywhere now – and people are making all sorts of cool things that I want a piece of, you know, literally. 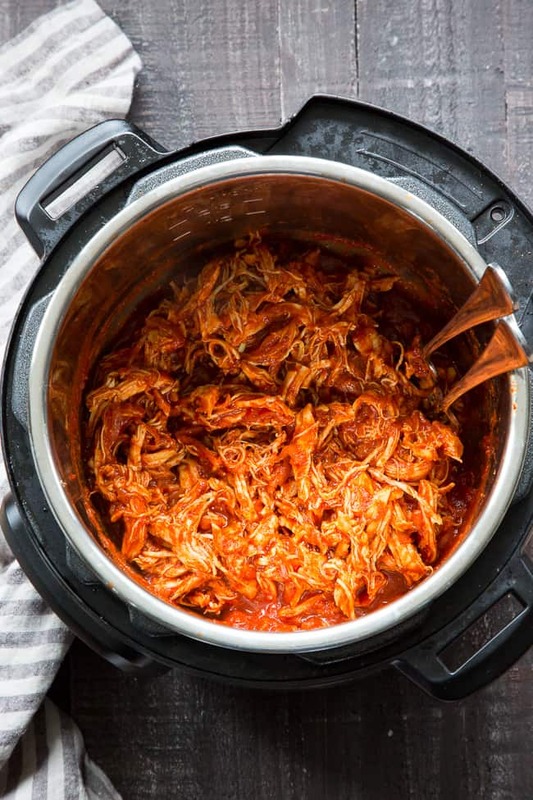 So, here we are – with an easy-as-heck beginner Instant Pot recipe that also happens to be so flipping tasty that I’m actually eating it cold out of a container right now. Not joking. 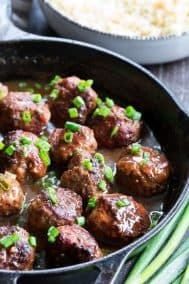 My Whole30 BBQ sauce was the inspiration for this recipe – the sauce itself is basically a spin on that original BBQ sauce, but with more water and tomato sauce to make it fit for pressure cooking. Since the sauce is sweetened with dates, you’ll need to blend it up in either a food processor or high speed blender – no worries though – this takes just 2 minutes! Then, we saute a bit of garlic and onion right in the Instant Pot (love that feature!) before adding the chicken and sauce to cook. And, it cooks to perfection in just 12 minutes – how cool is that?! Once done, we shred our chicken (seriously, it was perfectly cooked for this!) while cooking/thickening up the BBQ sauce with – once again – the saute function on the Instant Pot. 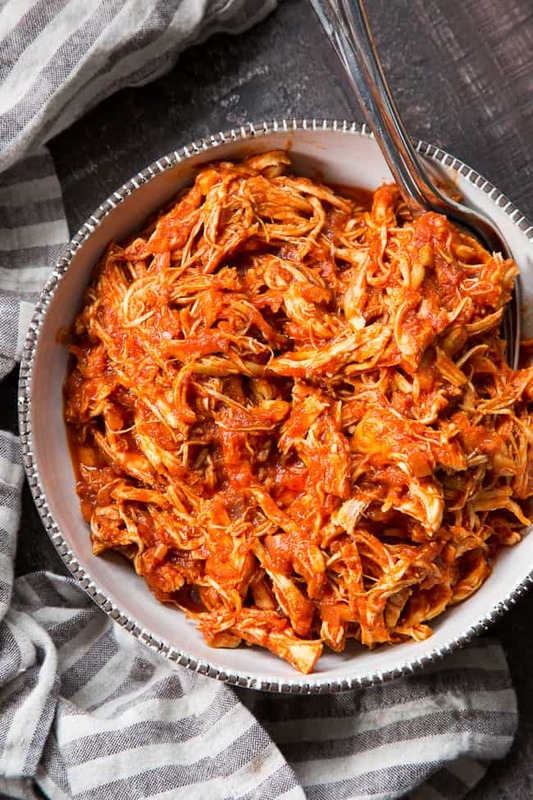 The shredded chicken goes back in with the thickened sauce – and WHAM! You can the perfect pulled BBQ chicken that’s ready for anything – topping a potato or sweet potato, lettuce wraps, or whatever’s in your game plan – including eating it straight out of a container like I’m doing. One note before beginning – I seasoned my chicken on both sides with this Primal Palate BBQ Rub – BUT – if you don’t have that, you can simply season with salt, pepper, and smoked paprika. I do highly recommend the BBQ rub though (and all their spice blends) because I’ve been using it on everything lately and love it. 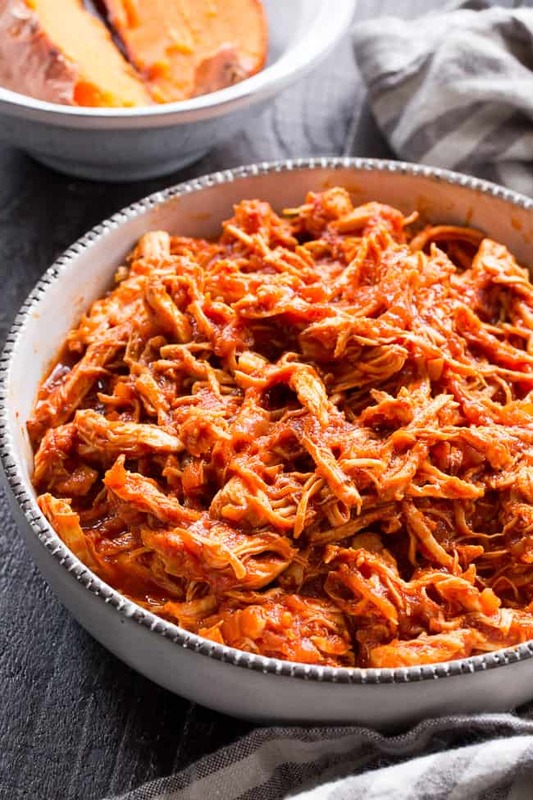 Okay, I think we’re ready – let’s get this Instant Pot BBQ Chicken going! 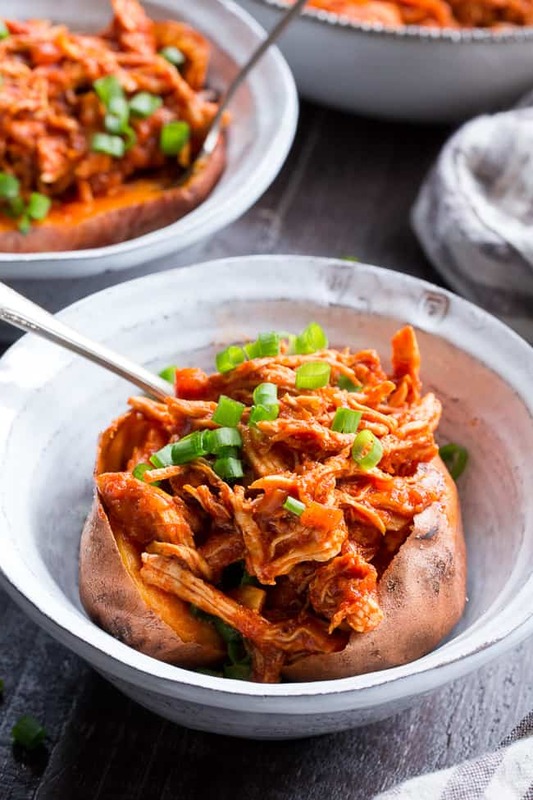 This simple Paleo and Whole30 Instant Pot BBQ Chicken is packed with flavor and perfect over a sweet potato or your favorite greens! An easy homemade BBQ sauce is cooked right in with the chicken for a meal that's ready in 20 minutes - perfect for weeknights and family approved! Soak pitted dates in the very hot water (almost boiling) for 2 minutes, until softened. 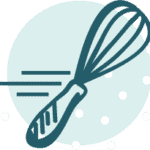 Place dates and water in a food processor or high speed blender, followed by the remaining sauce ingredients. Blend/process until smooth, set aside. Add olive or avocado oil to instant pot and set on “saute”. Add onions and sauté 1 mins, add garlic and continue to saute until just softened (30-60 seconds) then press “cancel” to turn off saute. Season chicken with the BBQ rub on both sides, or with salt, pepper, onion and garlic powder instead. Add it to the pot, cover with 2 cups BBQ Sauce and gently stir to coat. Set lid in place and turn steam release to “sealing” and cook 12 mins on high pressure. Once time is up, quick release the pressure by turning steam release to “venting”, then carefully open the lid. Remove just the chicken to a plate and set aside, leaving all sauce in the pot. Turn instant pot to “saute” once again to cook the sauce. Stir and cook until thickened to preference - about 2-4 mins. Once thickened, press “cancel” to turn off heat. 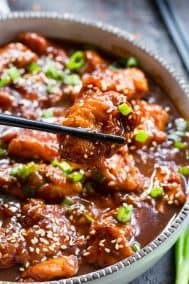 Shred all the chicken using 2 forks, then return chicken to pot and coat with sauce. Serve hot over a baked sweet or white potato, or with your favorite greens. Enjoy! Oh my word this looks sooooo good! Do you think this would cook alright in a slow cooker? I don’t have an instant pot unfortunately! THANK YOU for this recipe! Don’t ask me why, but I cannot tolerate tomato paste for some reason, and literally EVERY single store-bought BBQ sauce has tomato paste in it! I can’t wait to make this!! Oh that’s funny! It’s in my regular BBQ sauce recipe but figured it wasn’t necessary since I needed more liquid anyway, enjoy! I would love to try this in my slow cooker. Do you think it would work? Prepare the sauce, saute onions, garlic the oil, add to pot with chicken, cover with sauce and cook on low? Yup I think that would work well – I’d say low for maybe 5-ish hours? I meant to type….saute the onions and garlic in the oil, then add to pot with chicken…. I MADE This tonight and my husband and I absolutely loved it ! Gave us plenty of leftovers and it was so full of flavor. 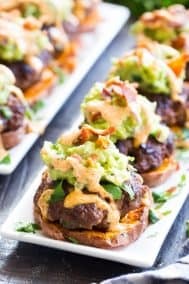 I’m new to your blog, but have already tried so many of your recipes and they’ve all been amazing! Thank you! I made this tonight and it was very easy to put together, and I am not an accomplished cook and have to use the recipe. Both my husband and I thought it was very good. I thought the sauce was really good and the chicken was fall apart tender. I served it over sweet potatoes as suggested and roasted some vegetables to serve alongside. 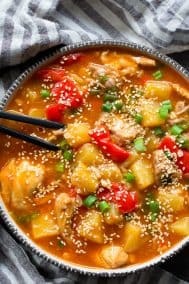 This is my second recipe from this website and both were winners! Keep up the great work. I have a stove top pressure cooker . How long would you suggest I cook it under pressure? Not sure but I think the time might be similar? 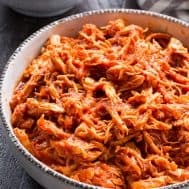 I made the BBQ chicken in my crock pot it turned out good but the taste of tomato is so strong there’s no spice, any suggestions? Made this yesterday night for the first time. I think the recipe name is inaccurate. There is no “bbq” flavor. Not saying it’s bad (it’s definitely tasty) it’s just not bbq. 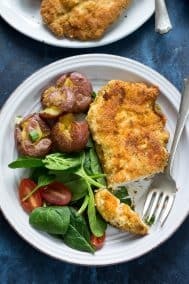 Would love to try this recipe – is it possible to cut the recipe in half? There’s only 2 of us and I hate leftovers. Wasn’t sure if doing that would make a difference in the cooking time in the instant pot. Doubled the recipe so this is likely an issue here but sadly it tasted like tomato sauce chicken. And the chicken breast was sooooo dry. I had a feeling since I dont particularly care for tomato sauce bbq sauces. Anyway, just my experience! 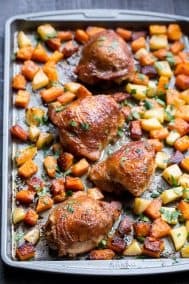 This is the best bbq chicken truly, I have ever tasted, and it’s Paleo!!! I just want this recipe now and no other. The sauce is so flavorful, not too heavy, not too light. Most bbq chicken is very gooey and too sweet but this is perfect. Thank you Michelle! I just wanted to let you know how much I enjoyed this article. I am happy that you just shared this helpful recipe with us. Awesome recepie. Thank you so much for share this post. Since you only call for 2 cups of bbq sauce over the chicken is the rest just left over sauce? Hi, I am brand new to instant pots. This is the first recipe I have tried. I doubled this recipe so that my family and I could enjoy left overs. The model I have is an Ultra 8qt. After a little while the screen beeped and said “burn”. Im not sure what I did wrong but my chicken was also not cooked through.